Hostas are one of the most popular perennials sold all over the globe. These shade tolerant plants, with a wide variety of sizes, leaf shapes, colours and patterns are the passion of countless hobbyists, collectors, breeders, clubs and societies. There are several thousand of named cultivars. Botanists say that the genus Hosta contains over 40 species. All are excellent, hardy perennials with a clustered, non-tuberous rootstock. Hosta is named after N. Th. Host. Mr. Host was born in 1761 inFiume and passed away in 1834 inVienna. He was an Austrian doctor and the personal physician of Emperor Franz the First of Austria. Mr. Host was an expert and a writer of the Austrian flora. A synonym for Hosta is Funkia, named after Chr. H. Funck(1771-1839) a pharmacist in the Syrian city Bayreuth. He was a collector of Alp plants and trader in dried plants. The synonym Funkie for Hosta was declared invalid in 1905, but it sometimes is still used in the nowadays literature. Most of the species are indigenous to Japan, but also found in China and Korea. Besides in shady forests, Hosta is also found in thickets and grasslands, especially in river valleys. The firmness of the leaves of some species indicates that they will tolerate an occasional period of draught. Their green; steel blue; yellow or variegated leaves represent one of the most decorative perennials for foliage. Shortly after their introduction in the 19th century, Hostas were primarily used in formal gardens for specimens, mass plantings or edgings. Today’s gardeners recognize their potential for naturalizing in shady sites, among trees and near water. Nowadays, Hosta is a very popular and undemanding perennial. In the USA and United Kingdom, Hostas, including the variegated forms, are used to cover large areas, resulting eventually in low maintenance, weed-free beds or borders and combine well with Astilbe; Hemerocallis; Ferns and other moist shade ornamentals. The blue-leaved Hosta will turn greenish with too much sun or in dark shade. Their blue colour is at its peak in semi-shade to full bright shade. The golden yellow forms develop best foliage colour with a few hours of morning or evening sunlight. Hosta starts shootingrather late and leaves an open spot in the garden in the early weeks of the Spring. Suitable companion plants are Corydalis cava and Corydalis solida which bloom early and than die back. The soft-leaved species and cultivars of Hosta, are susceptible to slug damage and must be appropriately protected before active growth in Spring. In the scope of this article, it is no use to describe the species with all its named cultivars etc. It is not interesting for the readers to be too detailed and to write too scientific. In the USA, where the Hosta is exceptional popular, collectors are spoiled by the specialised companies which have tested and selected the best varieties out of thousands of cultivars. Those are offered under the Trademark DESIGNER HOSTA COLLECTION. Distinctive(point 1) means: the chosen Hosta must be attractively unique in one ore more of the following traits: leaf colour; variegation pattern; size; landscape clump form; substance of leaves; texture of leaves and last but not least aesthetically pleasing long lasting flowers. In order to evaluate the Designer Hosta candidates, a group of specialty Hosta growers is assembled from six regions of the USA. Together, these growers have a combined total of over 150 years of Hosta growing experience in the climate zones 4-7. six testing sites in total. Designer Hosta candidates are over wintered and evaluated in each of the six testing sites for a minimum of two growing seasons based on the list of criteria above. They are compared to all other cultivars known to the specialty Hosta growers, which often number 500 or more. Only those cultivars that perform superbly in all of the testing sites nationwide may become a member of the exclusive Designer Hosta Collection. At this very moment, the Designer Collection consists of 12 varieties. BLUE MOUSE EARS. Adorable small Hosta with thick, heart-shaped, blue-green to grey-green leaves. Forms a perfectly symmetrical mound. Clusters of lavender, bell-shaped flowers emerge from balloon-like buds. CAPTAIN KIRK. Broad leaves of heavy substance, with wide, dark green margins and bright gold centres. Pale lavender flowers. An improved sport of GOLD STANDARD. Has much wider dark green leaves with golden centres and a heavier substance. EARTH ANGEL. A superb new sport of Hosta Blue Angel. Large, heart-shaped, blue-green leaves with wide, creamy-white margins. Pale lavender flowers. INDEPENDENCE. Reverse sport of Hosta revolution. Dark green leaves have creamy-white margins that are speckled with green. Large, pale lavender flowers. LAKESIDE SHORE MASTER. A vigorous member of the Lakeside collection that commands attention in the garden. Emerges with blue-green leaves, then develops rich yellow centres. Mature leaves are thick and seer-suckered. Flowers are pale lavender. OLD GLORY. A sport of Hosta Glory. Heart-shaped leaves with golden-yellow centres and irregular, wide dark green margins. Light lavender flowers. Really brightens up shady areas!!!! PRAYING HANDS. Definitely a collectors’ item!! Upright, narrow, tightly folded leaves resemble hands folded in prayer. The dark green leaves are heavily rippled with very thin, gold margins. Lavender flowers. RAINFOREST SUNRISE. An exiting sport of Hosta Mauti Buttercups.. leaves emerge light green, then quickly develop dark green margins and a radiant gold centre. As they mature, the thick leaves become lightly cupped and heavily puckered. Light lavender flowers. SATISFACTION. 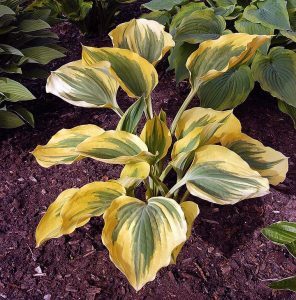 A large, natural sport of Hosta Piedmont Gold that is simply stunning. Large, deep green leaves of good substance display prominent bright yellow, wavy margins. The heart-shaped leaves form a wide, low mound. Near-white flowers sit just above the foliage. STAINED GLASS. A sport of Hosta Guacemole. It has huge, brilliant gold leaves, with wide, dark green margins. Large, fragrant pale lavender flowers. Sun tolerant. There are of course plenty of so-called Classic Hosta cultivars which are perfect, though not belonging to the DESIGNER HOSTA COLLECTION. In my introductory, I already mentioned that Hostas in general are the passion of countless hobbyists, collectors, breeders, clubs and societies. 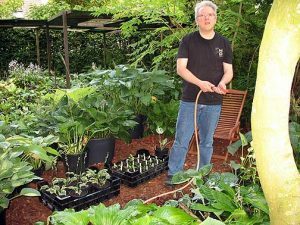 One of them is the Belgium Hosta collector, Mr. Danny Van Eechaute. At this very moment, Danny has 2400 different named Hosta varieties in his collection. He knows the name of each variety; knows how it looks and knows the characteristics of each individual cultivar; which the parents are, as well who the breeder is, and so on. Danny grew into the subject Hosta step by step and nowadays he is a walking encyclopedia for breeders; scientists; collectors and hobbyists.Danny is able to answer any question about Hosta, one might have!!! Danny was born in 1965 in the BelgiumCity, Gent. Like all children, he loved animals, but his fascination for plants already came into being when he attended the primary school. The school he attended, was situated near a park and now and than it happened that he came too late at school because of watching the bushes and trees in the park. When Danny was 9 years old, his uncle presented him a Hosta plant. He did not know the difference between annuals and perennials at that time, but to his big surprise, the Hosta started shooting in Spring. How fascinating!! Within a couple of weeks the Hosta came out shooting and unfolded its leaves.What a masterly example of vital and vegetative force!!! It was the first time in his life that he experienced this and his young and receptive mind felt in love with Hosta from that particular moment on. During the years, he changed some plants in his small garden, but his Hosta was a stayer. Being a teenager he found additional cultivars on plant markets and as Danny liked the forms of the leaves and the variation, he bought them. Also in Danny’s life the moment had come that he left his parents house. He moved to a small city, named Deinze,just located between the Belgium cities, Kortrijk and Gent and at a distance of 65 km from the Belgium Capital Brussels. Danny says: “at my house in Deinze, I got a real garden. What a difference with the small garden at his parents house!” Still being fascinated by bushes; trees and plants generally, he visited plenty of garden-centres and found more Hosta varieties and his interest exited. He became a willing victim of the “Hosta-microbe”. He travelled all over the country to find new Hosta varieties and in this way he collected 15 varieties. The “breakthrough” in collecting Hostas came when he met with the Belgium Hosta grower, Ignace van Doorslaer, who grew over 200 Hosta varieties , an exceptional quantity at the end of the eightiesof last century. Ignace informed Danny about the American Hosta Society. A complete new world opened up for him. Danny started communicatingabout Hosta with American breeders, which was not so easy at that time. It was quite time-consuming; the e-mail did not work optimally, but by trial and error, he began to import Hosta from USA breeders and collectors with, however, from time to time, disappointing results due to lack of experience. Parcels with plants were for too long time on their way so that the plants got lost, or the plants remained at the Customs for reasons out of his control and did not survive. Nowadays it is much easier. Though Danny’s collection consists of 2400 cultivars now, he does not collect Hosta, just because it are Hostas, no, on the contrary. The cultivar must have a surplus value: colour; shape; firmness etc. Danny himself started breeding Hosta 10 years ago. Some of his introductions are: Little Red Rooster; Fragrant Light; Fragrant Bouquet; Sky Dancer; Flemish Sky(introduced by WaltersGardens in the USA); Watermark; Pistache; Flemish Gold etc. Most of them can be obtained from Dutch nurseries. Future introductions are: Dino; Baby Doll; Glamour; Poker and…many others. 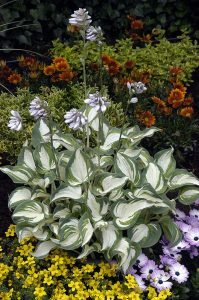 Brand new are the so-called striped-leave Hostas, such as Hosta Confused Angel; Hosta Flemish Clouds and Hosta Well Shaked. It are typical Collectors items, commercially not so interesting(bulk production). Each year, Danny visits the annual Hosta Convention in the USA; pays a visit to American breeders in order to keep up with their results.